Confiscation of Gold – Possible or Not? 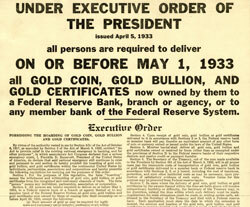 QUESTION: Do you think gold would be confiscated by government as was the case by Roosevelt? ANSWER: Absolutely. It is a question that we must confront. As long as they think money is tangible and they seek to satisfy the bankers by servicing the debt, then they will do whatever it takes to retain power. You stand ZERO chance of preventing that in a court of law. The confiscation of gold was NOT a law enacted by Congress. It was simply an executive order directed by the White House. The Supreme Court upheld that so the “people” never elected members of Congress to even vote on the subject. The President can do the same thing without warning today. Ask yourself this question. How many Jews would have survived had Hitler been endowed with the powers of the NSA today? They could have located everyone and then any questions would have been resolved with a DNA test. Obama lost the gun issue. So what is he doing? He has every agency buying all the ammunition so there is a huge shortage. Then he is implementing registration of ammunition. There is no democracy. The people have no say in anything. They are out to preserve their power – that is it. As long as they THINK money is physical in some manner rather than truly electronic, then they will continue to hunt down assets and expand their confiscation to justify their actions. The King of England used the criminal law to raise money. He first created the concept of the King’s Peace to interject himself into every private dispute and demand fines after Magna Carta shut down his right to simply fine people at will. At the time of the American Revolution, he had more than 200 felonies all carrying death penalty because that enabled him to confiscate all your assets and your family were thrown out on the street. He then created misdemeanors, which he could not justify death so he sold you as a slave and shipped you off to America as an “indentured servant”. You had to work for whoever bought you and when you were done, nobody sent you home. They destroyed families all because of money. Governments have been confiscating assets for centuries. That is what they do. Rome forgave all taxes of Romans because they confiscated so much wealth from Carthage. 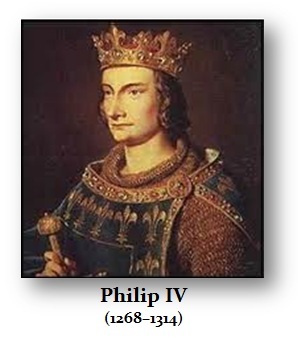 The French have a long history of confiscating assets dating back to Philip IV (1268-1314) who confiscated the assets of Italian bankers, the Knights Templar, and then seized the Catholic Church and moved it to France. 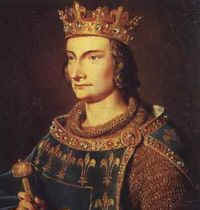 Edward I (1239 – 1307) confiscated all the assets of the Jews when he could not repay his loans and expelled them from Britain. Spain used the Spanish Inquisition to confiscate assets of the Jews and Arabs. All governments abuse their position to simply take whatever they want when they want and justify it by enacting a law. The communist revolution confiscated all the assets of everyone. Constantine the Great (272-337AD) claimed to be Christian seeing a cross in the sky to defeat Maxentius who built the first Christian church in Rome and then confiscated all the assets of all the pagan temples who had been the ancient bankers. When the French Revolution took place, yes they too issued currency that went into hyperinflation because the smart rich fled to Geneva and they issued more notes than there was backing. They issued currency backed by the assets they confiscated from the Catholic Church. Napoleon even imprisoned a Pope. The assignats were a paper currency redeemable at first paying 5% interest. They were issued over the strong objections of many members of the National Assembly, who still remembered the disastrous inflation caused by John Law’s bank in 1720. The notes were intended as short-term obligations pending the sale of confiscated crown and church land. 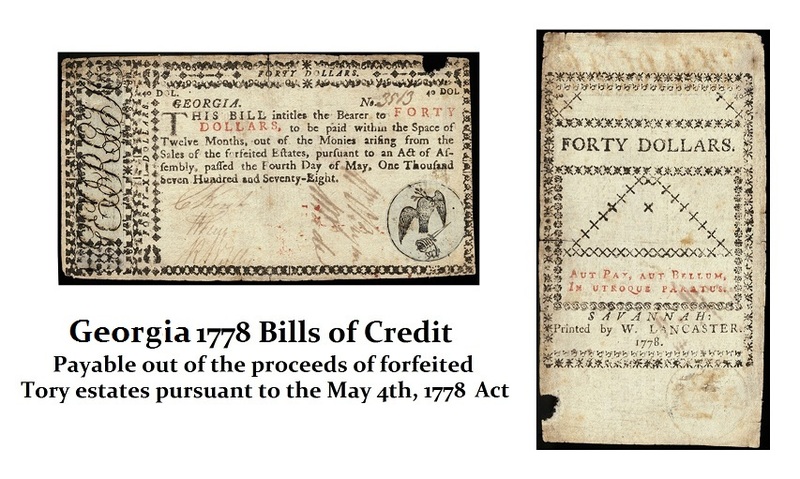 They were made legal tender in Apr., 1790, and subsequent issues bore no interest. 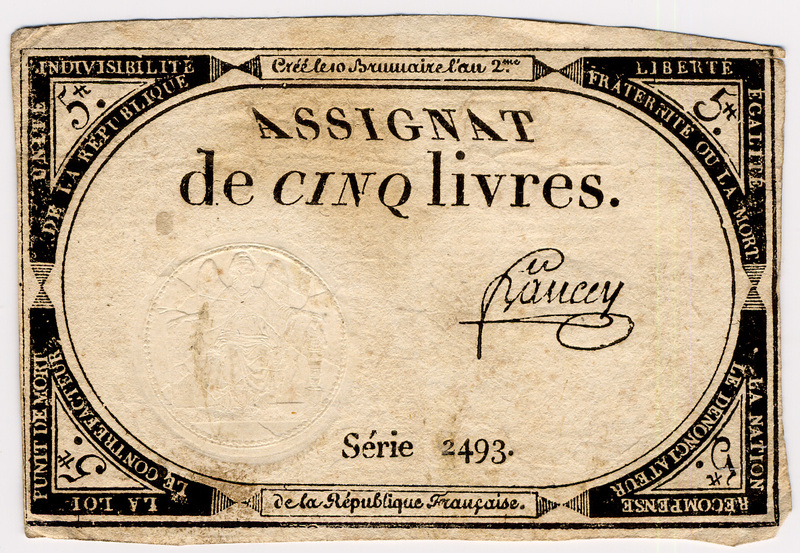 French citizens could use the notes to buy the confiscated lands, and the notes paid into the treasury were to be destroyed. The currency rapidly became inflated for two reasons: (1) As the government sold off the lands, the backing for the notes was reduced, and (2) Notes paid into the Treasury were usually not destroyed, but spent as corrupt government official were pocketing the redeemed notes on a grand scale. During the American Revolution they too issued currency that went into hyperinflation backed by assets they confiscated from British citizens. Most people do not realize the extent of this confiscation of assets by the American Colonies and that despite that fact that the war was over, the British had not completely abandoned the United States. Tensions remained high and some British troops refused to leave even after the treaty had been signed. British troops refused to leave the forts in Detroit, Otsego, and New York all because the colonial governments refused to return land confiscated from Tories during the war. The Marine’s Hymn begins “From the Halls of Montezuma, To the shores of Tripoli.” Yet most people have no idea what Tripoli in Libya has to do with the Marines. American sailors were no longer under British protection after the Revolution and were being captured and sold into slavery by North African pirates from Tripoli. In 1785, pirates from Algiers captured an entire crew from an American merchant ship off the coast of Portugal. In the USA, following the surrender of the British at Yorktown, Washington moved over 11,000 troops to the town of Newburgh in New York. After waiting several months, the men of the Continental Army were ready to take up arms against the government for its lack of payment. Officers from the Army came together to take action against the Continental Congress and in June 1783, they marched on Philadelphia. The soldiers threatened to hold members of the Congress hostage until their wages were paid. The Pennsylvania militia refused to assist the members of Congress and they were forced to relocate. Eventually, George Washington came to their aid and encouraged the soldiers not to act violently. He stated, “Do not open the flood gates of civil discord and deluge our rising empire in blood”. 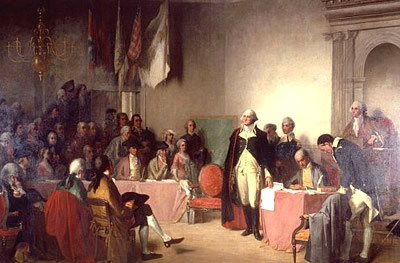 According to legend, Washington pulled out a copy of the letter that he had received and told the officers his eyes had grown blind in service to the nation. Respecting Washington’s lifetime of service, the officers stood down and the revolt was averted at perhaps the most vulnerable time in the nation’s history.Thanks to Washington’s involvement and words to the soldiers, no violence erupted. Nevertheless, this rebellion became known as the Newburgh Conspiracy that the history books often leave out. Countless governments have confiscated assets calling it “nationalization” when governments move into economic meltdown. You have Argentina seizing all pension funds. Nigeria in their coup nationalized oil as did Iran. This is standard operating procedure. To even say that government will not confiscate gold is absurd. They know everyone who has bought it. They could just as easily issue an executive order as they did before and confiscate anything. They routinely confiscate all assets of anyone caught with drugs even if they had noting to do with drugs. If you travel with a lot of cash they just seize it and assume it is illegal. This is commonly called Policing for Profit. They have transformed the drug laws of money laundering into tax evasion claiming anyone with a foreign account not reporting that money is engaged in money laundering and they get to confiscate everything you have and you go to jail for up to 25 years. 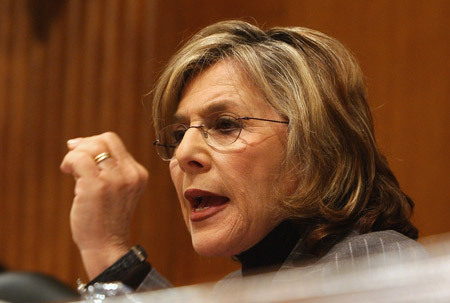 Barbara Boxer’s Highway Bill included the right to revoke your passport if the government even think you owe $50,000. Anyone who think government CANNOT or WILL NOT confiscate gold is dreaming. Load up your pockets and try to get on a plane. Bet they call it money laundering. You can do nothing. The Iron Curtain is closing and they are intent to make it air-tight.